Looking more like an e-cig vape the E-Clipse has a unique and understated flair that comes off nice and discrete to take out and about with you. With a tapered silhouette and an overall narrow body it feels great in the hand and is light weight (lighter than a lot of the competition). The Screen is bright and there are up and down buttons to regulate/set the temperature of the chamber to dial in the perfect intensity and heat. The large ceramic cylindrical bowl/chamber is easy to access from under the mouth piece and you have a choice of a standard mouth piece or a tubular (both included). It’s surprisingly sleek and the fit and finish are quite good for such an affordable price point. The materials are mainly plastic but feel good enough, costs need to be cut somewhere to offer such a great price. Many of the competitors are at least $100 to double the cost. The packaging is great and there are lots of spares and cleaning tools included. The only con in the design is more of a finish issue, the mirror like finish is a total finger print magnet. Not a huge deal, but for OCD types like us, you will be constantly cleaning/buffing it. The interface is very easy to use with 5 clicks on/off, set the temp, watch the real time temp gauge, hit your temp, and vape. The Speed of Preheat has got to be the best we have seen. Flavour is very good, rivalling that of the FireFly or a PAX, intense, smooth, and easily dialled to the perfect temperature. Airflow is pretty spot on too, more open than a Firefly but maybe a bit more restricted than a PAX. There really is nothing like convection dry herb vaping. The Chamber is large, fitting what felt like 1 gram of Dry Herb. Filling is not too much of a problem and using the included tools help to tamp down and clean up once filled really helped. We didn’t tamp down like crazy to leave enough space for airflow to travel through and didn’t have a lot of trial & error to dial it in too our liking. Cleaning is also very easy thanks to the included tools. NY Vape Shop has a ton of great Herb Grinders and it’s a must to have as finely ground Herb as possible to get the best results, so make sure you pick one up if you don’t already have one. Fit & Finish like we said is good, could it be better? Sure, but at such a great price point you can be a little forgiving. To most the Fit & Finish is great, but with closer inspection you can see some imperfections in the finished and fitments, but again nothing to cry about. We would love to see some other finish and and colour options, the mirror finish is definitely not our first choice in any device (finger prints). Battery Life is good to decent, getting about 2 bowls per charge. There is another con here, unlike say a Firefly that using a fire button to take each inhale, the E-Clipse is constantly on while vaping. This is great, for you simply inhale with nothing to press, however in a group setting with conversation going on (come on it’s herb) there can be time past between inhales with the battery draining/maintaining your desired temp. Not sure if this is a huge issue, 2 bowls is pretty good on a charge and they are big bowls, and this is pretty common capacity/life in the space. Another nice note, the device stays pretty cool to the touch even after heavy use. We are very impressed with the E-Clipse, NY Vape Shop really has a great product offering here. If you have ever been curious about a Dry Herb vape but didn’t want to invest the $100s, well now there is an extremely solid option. 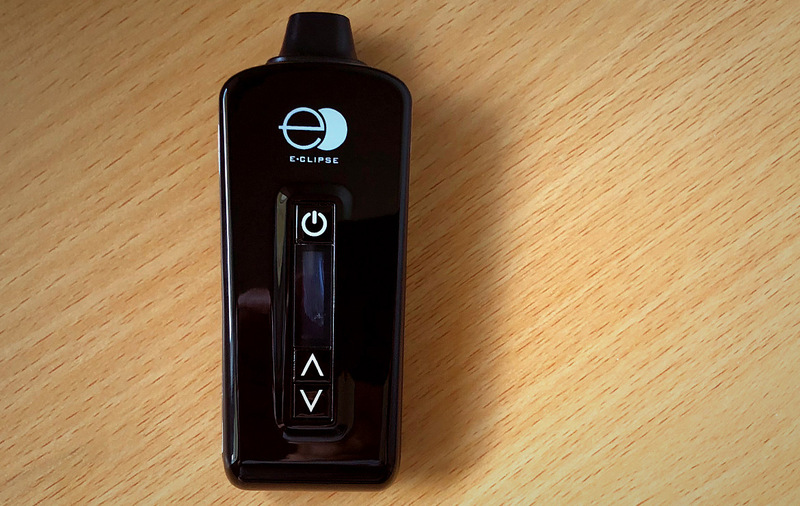 For the $140 price the E-Clipse is hard to beat, maybe the only issue is it only does Dry Herb, where as a lot of other vapes are trying to offer solutions for other compounds (they are much more expensive though). But trying to do too much usually leads to not all being good. This is a great vape that does its intended job perfectly and with ease. This is a no brainer, go get yourself one.